The first time I heard about the Gruffalo was when we watched the Gruffalo's Child at last year's KidsFest. Yes, seriously. It took me four years after becoming a mum to learn about this monster-like hybrid that is half grizzly bear and half buffalo, who somehow managed to bewitch millions of kids around the world, including mine. Soon enough, we bought copies of the Gruffalo's Child and The Gruffalo, which even came with a DVD so we could watch it over and over again while imagining we were taking a stroll with the Mouse through the deep dark wood. 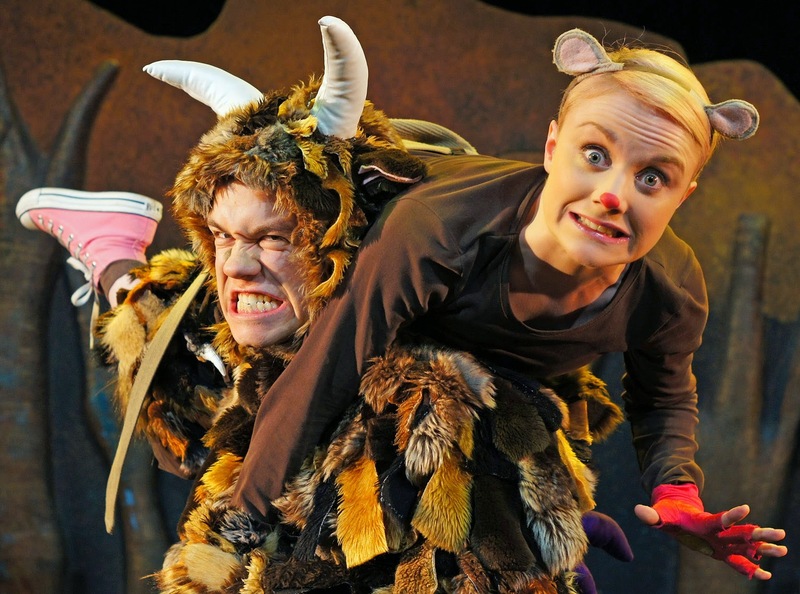 When we heard that KidsFest 2015 will be showing eight productions over five weeks and one of them is The Gruffalo, you bet we jumped for joy. 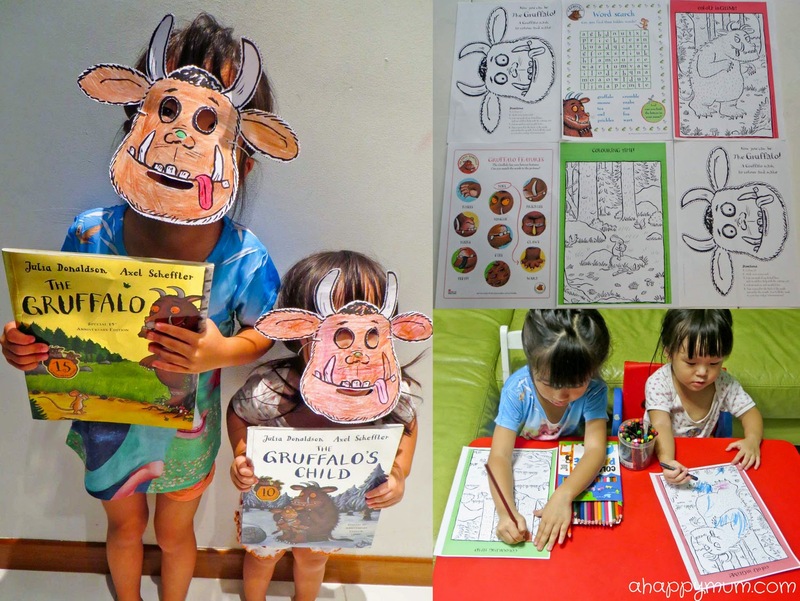 In fact, to psyche the kids up for the opening show, we not only read the book and watched the DVD, we also conducted an art and craft session which was, of course, to the Gruffalo theme (more fun activities can be downloaded from KidsFest website here). Now, we were all set to meet the Gruffalo and Mouse! The production, held at the SOTA Drama Theatre, runs for 55 minutes with no interval and is suitable for children aged 3 and above and their families. That being said, I am so thankful there is no minimum age requirement (as long as you present a ticket) because my two-year-old totally enjoyed the whole show too. The show turned out to be even better than we had expected and we were kept engaged from start to end. I loved the catchy songs, cute dancing, fascinating dialogue and appreciated the fact that the crew made considerable effort to interest, and amuse, not just the children but adults as well. Yes, we were all so engrossed in the show - we roared, we screamed, we guffawed, we chortled - and it was a good amount of fun, laughter and entertainment packed into one hour. My favourite part was when the Gruffalo jumped off the stage at the end to interact with the audience - that definitely made my kids sit tight! I love how KidsFest brings favourite story characters to life and enacts scenes from well-loved children's books. It gives me a chance to interact, laugh and bond with my kids, and allows me to relive a part of childhood that I miss. Thank you, KidsFest, for this wonderful experience! 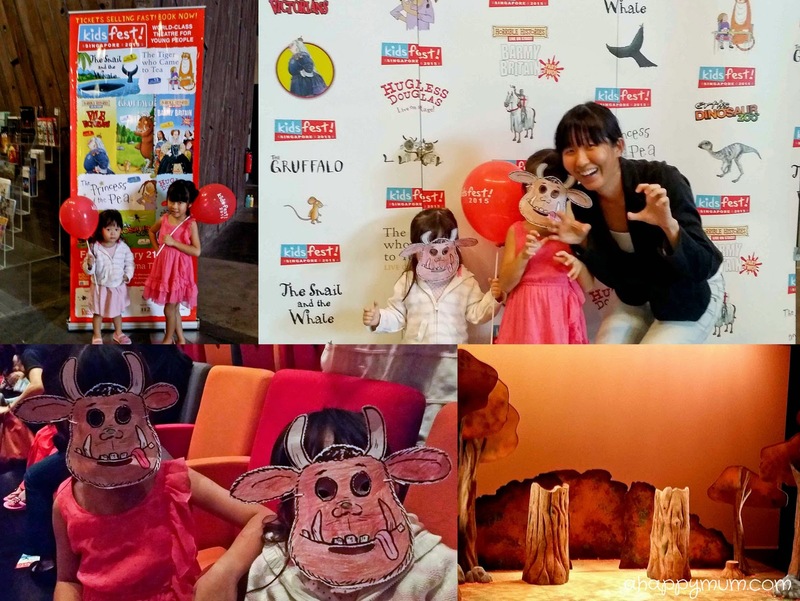 It was a pity we did not get to meet and greet the Gruffalo because there were two excited mini Gruffalos who were seriously hoping to take a picture with him, nonetheless we are definitely looking forward to watching more shows as a family in the future! For those of you who are keen to know, here is the line-up for KidsFest 2015. Which is your favourite of all? Read on and see if it is the show I am giving away Cat 1 tickets to at the end of the post! Join Mouse on an adventurous journey through the deep dark wood in this magical musical adaptation of the award-winning book by Julia Donaldson and Axel Scheffler. Mouse can scare hungry animals away with tall stories of the terrifying Gruffalo, but what happens when he comes face to face with the very creature he imagines? The doorbell rings just as Sophie and her mummy are sitting down to tea. Who could it possibly be? What they certainly don’t expect to see at the door is a big, stripy tiger! Following on from his highly successful run in London’s West End, the tea-guzzling tiger makes his Asian debut in this delightful family show packed with oodles of magic, sing-a-long songs and clumsy chaos. Hugless Douglas is a huggable, lovable young brown bear who wakes up one morning in need of a hug. He tries to find the perfect one but none of them seem quite right. After all, there are so many different hugs to choose from. But Douglas soon discovers that there’s only one hug that will do - a big bear hug from his mum! Join Douglas in this happy new show, full of laughter, sing along songs and plenty of opportunities to join in! Imagine a hidden place with forgotten stories, a place where the Princesses don’t know they are Princesses and the Princes don’t really want to become Kings. One wintery stormy night, everything changes as the east wind blows through the castle of secrets, blowing away the cobwebs, lifting high the royal mattresses, ruffling feathers and unsettling all who live there. Then, imagine a real Prince and a real Princess, oh and a pea! ‘How I long to sail’, said the tiny snail. A tiny snail longs to see the world, so she hitches a lift on the tail of a huge humpback whale. Together they go on an amazing journey, experiencing sharks and penguins, icebergs and volcanoes. The little snail is amazed by it all but starts feeling very small in the vastness of the world. Then disaster strikes and the whale becomes beached in a bay. Can the tiny snail save the day? Meet awesome prehistoric creatures, from cute baby dinosaurs to some of the largest carnivores and herbivores that have ever walked the planet. In this fun and educational performance, you can get up close and personal with an amazing array of creatures from bygone eras, meet a menagerie of insects, mammals and dinosaurs that once roamed free around the world and step into the real science of palaeontology. Could you beat battling Boudicca? Has William Wallace met his match? Can evil Elizabeth entertain England? Will King Charles keep his head? Escape the clutches of Burke and Hare and move to the groove with party Queen Victoria! Don't miss this horrible history of Britain with the nasty bits left in. We all want to meet people from history. The trouble is everyone is dead. So could you be a Victorian historian? What exactly did a baby farmer do? Can you escape the misery of the mines or the filth of the factories? Do your best to dodge the rotten railway and prepare for the Charge of the Light Brigade! Join the terrible team as they take you on an awful adventure into vile Victorian England. Standard tickets priced at S$42, $52 and $62 are now available on SISTIC website. You can also book your tickets at any SISTIC outlet or phone the hotline on 6348 5555. Enjoy a 10% discount when you book two shows and a 15% discount when you book three or more. You can also show your purchased tickets or ticket stubs at any SISTIC outlet to receive a 10% discount on additional tickets. For showtimes or more information on KidsFest 2015, visit their website and Facebook page. This giveaway is open to all readers residing in Singapore only. Winners will have to self-collect the prizes at ABA Productions office located along Upper Circular Road on weekdays during office hours. Three different winners will be picked. Winners will be notified by email and will have 48 hours to respond or a new winner will be chosen. To participate, leave a comment in this post with your name and email address. Indicate in the Rafflecopter widget that you have commented and to increase your chances of winning, you can carry out the rest of the options. Best of luck! Disclosure: We were invited to the opening show of The Gruffalo at KidsFest 2015 and received complimentary tickets in writing this post. 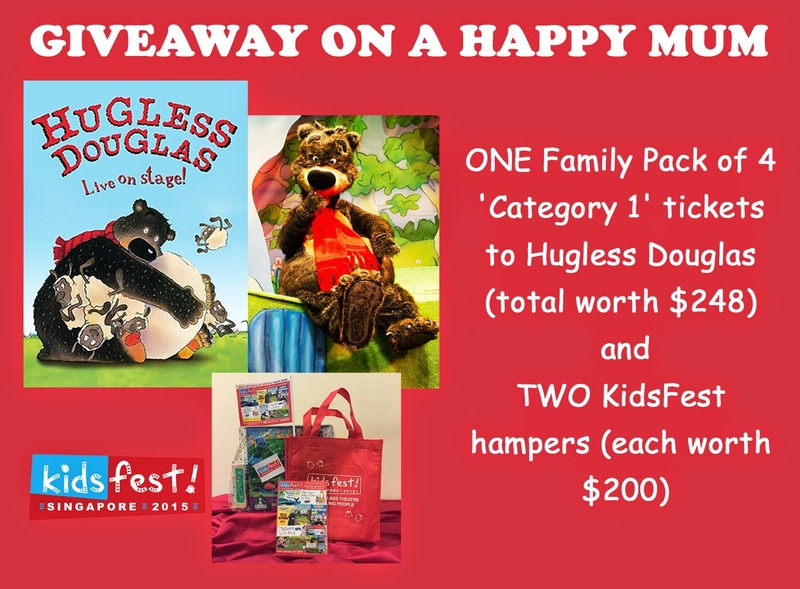 Giveaway prizes are provided by KidsFest and all opinions are my own. Thanks for the giveaway! Hope to win! My kids would love to watch one! my children love to watch the play! Hope to win, it's my kids' favourite play! Thanks for the giveaway!! Awesome that it falls on my girl's bday! Wonderful giveaway!! Hope to be the lucky one at least this time. Thanks. We're going to catch the Gruffalo later. Can't wait! Hopefully, we'll get to catch more of the KidsFest productions as well. Hope we are the lucky ones! Hope to win for my kids! We watch their performance last year! Hope to win for this year! Lovely giveaway..mum of almost 3 years but not yet addicted to the Gruffalo yet, definitely want to see what is the magic of it! The kids will be totally stoked to win this! Hope we get picked. We would love to bring the boys to watch it.